Ends on Fri, August 31 2018 11:59 PM EDT. City of Mist is a cinematic, neo-noir tabletop RPG set in a modern-day city where legends and stories incarnate in ordinary people, granting them mythical powers. Due to the mystical veil of the Mist, most City residents are oblivious to the legendary forces in the City, leaving modern-day legends, or RIFTS, to operate in a hidden underworld of fairy-tales and crime. City of Mist was successfully funded in 2016 and published in 2017. It already has a great community of backers and fans and has sold thousands of copies. The next evolutionary step for the game is a guided set of adventures in the world of City of Mist – a story arc – that MCs (or GMs/DMs) can easily run for their groups. Nights of Payne Town is the first story arc book we will publish, with ten (10) individual cases connected into a single overarching plot. READ MORE ABOUT THE GAME BELOW! City of Mist RPG won two ENnie awards: Silver for Best Free Game 2017 (Starter Set) and Gold for Best Interior Art 2018 (Core Book, which will be split into the Player Guide and the MC Toolkit books available on this campaign). City of Mist RPG has a wide range of Actual Play shows and podcasts for you to check out, from creators including Encounter Roleplay, Saving Throw, One Shot Podcast, Mistconceptions, Six & Twenty and many more. The game was featured on Geek & Sundry (and here), Nerdarchy!, RPG Academy, Delve Podcast, Creation Podcast, Tabletop Babble, BAMF Podcast and others. What makes City of Mist special is its unique premise and its bleak, yet mysterious, noir atmosphere. Your character, whether jaded or naive, lives in a corrupt metropolis where hidden forces steer the lives of millions. The situation is miserable, but you are awakening, beginning to become aware of the legend deep inside you. Together with your crew, you are trying to find answers in a city forever blinded by the veil of the Mist. You want to discover what is real, whether you are human or a legend, and who is running the show from the shadows. You are trying to discover the truth, and you’re up against heavy opposition. Think mobsters with the power of Greek gods, a corrupt politician enchanting citizens with his magical pipe music, and a biker gang called the Winged Monkeys working for an unsavory smuggler, a modern-day Wicked Witch of the West. If the GIF isn’t playing, click the image. Nights of Payne Town will present the first playable story arc that you can just pick up and play with your friends. It will contain of ten (10) cases that can be played individually, or as an ongoing campaign, each with its own backstory, locations, clues, NPCs, Dangers, and maps. The Criminal Vein, cases involving the rise of an unstoppable crime baron, a violent self-proclaimed monarch, and the struggle for power over the City streets. and The Personal Vein, cases trailing the personal tragedy of the victims of a scheme to slowly and painfully destroy the very fabric of society in the City. At the culmination of the story arc, these three veins combine into a single super-plotrevealing a sordid truth and a malignant power that has been feeding on the misery of the City since its early days. But, even there, in the heart of darkness, there is hope… even if is hidden from mortal eyes. Can your crew solve these cases, face these evils, and save the City? City of Mist is one of the most well-considered superhero RPGs out there. It feels and looks like the best of modern superhero comics and the Marvel Netflix-verse. It has the room to be gritty and hopeful while working as a detective, all in a single game. Nights of Payne Town takes the game to another level by offering a ranging adventure path. 10 cases that standalone or form a wider story, it’s your choice. You can see examples of their work at DriveThruRPG here. You can support this Kickstarter campaign here. Ends on Sun, September 2 2018 7:00 PM EDT. “All five parts of the Haunting of Hastur series in print for the OSR. The Haunting of Hastur series has been very successful for Dark Naga Adventures. However, they were never successful enough to unlock the OSR print run stretch goal. Several OSR fans have lamented this shortfall. This is my wish fulfillment project for the OSR community, particularly those fans who have waited for their version in the classic print format. This Kickstarter project has just one reward, all five modules in the old school print format: wrap around, detached covers, maps on the inner cover, saddle stitched (stapled) booklet. Simple. No stretch goals, just a low target small print run to give the backers who have wanted this version in this print format to have their wish granted. There is a little bit of editing to be done. See below on changes to DNH1 – The Lost Temple of Forgotten Evil. Beyond that, as soon as the project funds, I will order the proofs, and as soon as they are verified, the print copies will be ordered. This will be a fast cycle project. So fast, that there won’t be any add-ons available via Backerkit. I expect to place the print order a few days after the funds post to my account. Special Note: This might not be the project for you. This one will run the month of August. I am working on colorizing all of the art for a full color, hardback compilation version for 5e and OSR (separate books). I’m announcing both so that OSR fans don’t feel like they are being toyed with. One of my concerns is having a backer who would prefer the hardback decide to back this project because they had no idea the other one was in the works and regret their decision. That’s not cool. It’s not how I would want to be treated. Thus, I working to make sure that backers know their options, so they can make better-informed decisions. The editing work to be done. The first of the adventures was an experiment in dual stats for 5e and OSR. That was one of the weakest elements. Some found it confusing. This was my failure as a writer to see beyond my own experience. I convert between 5e and OSR on the fly when running my 5e game, or a BECMI/RC game (my Old School ruleset of choice, yes, I know maybe not technically OSR by all definitions, but in the most inclusive sense, OSR). I failed to recognize that part of my audience has no experience with both systems and they could be confused by unfamiliar terms. The only significant work to be done on this project is to sever the two versions into dedicated works. I’m estimating it as twenty hours end to end, including editing. That project will start within a few days of putting the 5e and OSR text of the last adventure in the series to rest, DNH5 – Carcosa. Dark Naga Adventures is Kevin Watson who I’ve interviewed about a part of Haunting of Hastur at the Open Gaming Network (here). Haunting of Hastur is a reprint of five D&D 5e and OSR adventures that Kevin has kickstarted one by one. Now you can get the full adventure in one location. 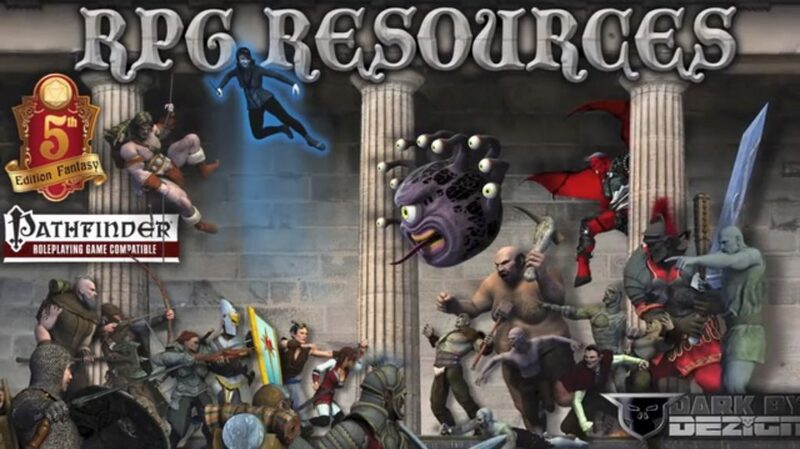 You can see examples of their work at DriveThruRPG here or at the OpenGamingStore here. Ends on Tue, September 4 2018 9:30 PM EDT. “Afterverse is a scifi tabletop RPG featuring an expansive and versatile world and the D6 Bank game system. Welcome to the universe. Here’s what comes next. The universe is a rough place, and now you’re in the thick of it. Whether you’re fighting the Bactaran occupation that begins almost as soon as first contact is established, exploring the new frontier of space after humanity throws off its chains, or working towards the unification of all the species of the Orion Arm of the Milky Way galaxy, Afterverse puts the universe in front of you and sets you against it. The d6-based game system is versatile and powerful. The usage of hit banks minimizes dice rolls and keeps gameplay flowing smoothly, while letting players control their risk factors. Characters earn XP through the innovative Motivation system, bridging the gap between powergamers and roleplayers. Set your campaign at any time across hundreds of years of future history. Every time period has its own events, conflicts, cultures, and technologies. Encounter enemies and allies of all shapes and sizes. Join the revolution, become space pirates, or command military might in space in epic wars across the galaxy. The Afterverse book features nearly 300 pages of game rules, settings, and adventures. Over 150 pieces of artwork created over the last five years illustrate the living universe, bringing your games to life. The book will be in full color as a softcover (or hardcover if the stretch goal is unlocked). The book contains all the information players and GMs need to run an Afterverse campaign, including character creation, base rules, the setting’s history, and more. If you’d like a sneak peek of what the sourcebook will look like, as well as an overview of the most important rules, check out the Quickstart Rules for Players! Afterverse’s Action Cards help you track your character’s hit banks. Each card features beautiful character art, a place to store your hit counters, and a summary of the relevant rules. These cards help player keep track of not only their hit banks, but also the actions their character has available to them. The Afterverse game system is based on pools of 6-sided dice. For most skill tests, you’ll add the relevant attribute, such as Agility, to the relevant skill, such as Melee; this determines the size of your dice pool. If the test involves a Specialization and you have that specialization, you’ll add two more dice. Situational modifiers may alter this pool further. After rolling, any dice that come up as a 5 or 6 count as a hit; if you get enough hits, you’ve succeeded the test. Sometimes, instead, hits will be banked to be spent over time. The initiative system in combat is based on this bank system. You’ll roll your character’s Reaction plus Perception, and bank your hits into your IP bank. Turn order starts with the highest IP bank and proceeds in order to the lowest; as each character acts, they will spend one or more hits from this bank. If the character has enough hits in the bank, they may perform additional actions by doubling the IP cost of the second action. But it may be wise to conserve your IP, because this same IP bank is used for dodging. When you are being attacked, you may spend one or more points to set the threshold which the attacker will need for their attack to succeed. This greatly impacts the strategic decisions of the game. Covering fire is invaluable, as you can force the enemy to spend their IP bank dodging your shots instead of shooting back. Finally, space combat is built on this same rule set. The Body Class system allows entities which are an order of magnitude larger than others to operate within the same combat at the same time; smaller entities receive a multiplier on their initiative rolls, while larger entities receive a multiplier on damage dealt, allowing a tiny vessel or even an individual person to act in the same combat as a battleship without skipping a beat. Often, when in space combat, several characters will all be performing important and unique roles in the fight. The ship’s captain makes decisions and controls the deployment of the ship’s countermeasures. The pilot may position the ship in different ways in preparation to attack, defend, or evade. The engineer is in charge of repairing systems as they get damaged, managing the ship’s waste heat, and supercharging systems which will be required soon. The ship’s tactical officers will control the firing of weapons. The ship’s crew, each with their own complimentary set of skills, must work together under the leadership of their captain in order to position their ship for attack, supercharge the coilguns, and finally, deal the critical blow against the enemy, drawing upon the banks from every crew position to maximize the damage against their target. My name is Ray Nothnagel. For my entire life, I’ve been a fan of tabletop games, science fiction, and real-world space travel. I’ve been working on the Afterverse rule set for the last five years and playtesting it for the last three. I’ve been designing the Afterverse setting since I was in junior high school – this universe has been kicking around in one form or another for twenty years, and I have the bad spaceship doodles from high school study halls to prove it. This campaign is just one more step in what has been my personal passion project for decades, and whether it succeeds or fails, will undoubtedly continue to be my unhealthy obsession for the rest of my life. The publication of this sourcebook is just one part of the grand scheme for Afterverse. The game system has come a long way since it started as little more than a homebrew variation of Shadowrun. Since that time, it has evolved into a unique game with innovative concepts and lots of refinements. The time spent on the game system has resulted in a robust and fun roleplaying experience where the rules enhance the setting, and don’t get in the way of the storytelling. This campaign aims to finance the final push for publication – the graphic design, final editing, and the print run. Immediately upon the successful funding of the campaign, we’ll begin our final art pass and the layout work for the book. Following up on this, within a month or two, we’ll send the final sourcebook to be printed. The bookbinding printer will do their thing, and all told, we expect to have the final version of the book printed and shipped out to you no later than the end of October if all goes well, or sometime in November in case there are unforeseen delays. Some of the higher tiers will take longer to produce, but our goal is to have all rewards completed and delivered no later than December 2018. Afterverse is a post-alien-invasion-space-opera. You use a mix of cards and handfuls of d6s to determine actions. John McGuire, myself, and our friends played Afterverse with Ray Nothnagel, the creator, at Gen Con 2018 (read John’s review here). When I talked to Ray, he shared that space combat is a highlight of the game because it gave each player a task within the system to perform (unfortunately, the session I chose did not involve space combat). Ray’ll be at Dragon*Con August 30th to September 3rd, 2018, in Atlanta demoing the game (and, hopefully, working on a space battle), so if you’re going it’s worth checking out. You can see Ray’s Afterverse events here. Ends on Wed, September 5 2018 11:32 PM EDT. “MAIN GAUCHE is a chaos expansion for ZWEIHÄNDER Grim & Perilous RPG – a gritty, dark fantasy tabletop role-playing game. Hi, my name is Daniel – some of you know me as the creator of ZWEIHÄNDER Grim & Perilous RPG, and face of Grim & Perilous Studios. I am a level 41 husband/father/raconteur, and have worked in digital advertising for 14 years. Were you to compare me to a character on the show Mad Men, basically I’m Ken Cosgrove: biz-dev guy on the streets/author in the sheets. Much like Cosgrove, I am a writer when I’m off the clock. Writing a RPG? Easy. Run the business? See illustration. I spent five years writing the brobdingnagian (read: mammoth) 688-page book you know as ZWEIHÄNDER Grim & Perilous RPG. I set up a Kickstarter, nearly two years ago to the day, to make it a reality. Following a very successful Kickstarter & CrowdOx phase, a feature article on Forbes, and a 3-month climb to DriveThruRPG’s Platinum Rated top 25 products, it drove over 62,000 copies of ZWEIHÄNDER moved worldwide to-date. ZWEIHÄNDER Grim & Perilous RPG also took home two golds in the ENnie Awards for Best Game and Product of the Year at GenCon 2018. Turns out, there’s a market for world-agnostic, gritty D100 tabletop RPGs that doesn’t rhyme with “Goonquest” or “Warslammer”. And after a stroke of inspiration, I began writing another book. Say hello to MAIN GAUCHE. CHAOS IS NOT A PIT – IT IS A LADDER. Plugging into the core D100 ZWEIHÄNDER experience, this book expands your gaming options into the realms of chaos and beyond. MAIN GAUCHE can also be used in your homebrewed campaign world, whether inspired by the works of Andrzej Sapkowski’s The Witcher, George R.R. Martin’s Game of Thrones, Glen Cook’s Black Company, Myke Cole’s The Armored Saint, Robert E. Howard’s Solomon Kane, Scott Lynch’s Gentlemen Bastards or other ‘grimdark’-inspired media. With over 186 Professions and 300+ spells across ZWEIHÄNDER & MAIN GAUCHE, you now have countless ways to create your own vision of grim characters ready to embark upon perilous adventures. Embrace the left-handed path of MAIN GAUCHE, where chaos awaits! This supplement requires ZWEIHÄNDER Grim & Perilous RPG to play. Like Zweihander with 666 dollops of chaos. We estimate that MAIN GAUCHE will come in between 300 to 400 pages after we finalize layout, in full, old school black & white glory. Like its predecessor ZWEIHÄNDER, it will be illustrated cover-to-cover by Dejan Mandic. If you have not gotten a PDF of ENnie Awards winning ZWEIHÄNDER Grim & Perilous RPG, you have not been paying attention. I got a free copy for attending Dan Davenport’s Q&A with Daniel Fox, another at Gen Con 2018 as they were giving away free copies via a redeemable code, and when I emailed Daniel about covering his $1 reward on MAIN GAUCHE because of the Stat Hat it included, he offered me a PDF of the rules and you know what I said? I said yes, Daniel Fox’s mom, because your son done good with this game! The core rulebook is 688 pages of great art and dark, yet fun ideas that resulted in it taking Best Game and Product of the Year at the ENnies. This follow-up expansion, MAIN GAUCHE, looks no less ambitious and worth checking out! Ends on Thu, September 6 2018 10:00 PM EDT. “Welcome to Domina Magica, the RPG about becoming a Magical Girl and fighting the forces of evil! Domina Magica is a tabletop role-playing game designed to emulate an episode of a Magical Girl Anime. You will create and role-play a School Girl in either Elementary, Middle or High and run through the typical scenario of everyday school life. You will make friends, you might make enemies, and hopefully make your next class on time. When you and your friends encounter strange happenings around the school, it is revealed that you are the next generation of Magical Girls!!!! You have been selected to help fight the forces of evil, and only the power of love and friendship that you posses will send these dark beings back to wherever it is they came from…….and all before dinner time. We designed this game as a fun, light-hearted way to engage with all the iconic tropes of the Magical Girl Genre. Magical Girls is a sub-genre of the Japanese fantasy manga and anime, featuring girls with magical abilities, or who use magic to transform. This sub-genre dates back to the 1950’s and has become increasingly popular due to the magical renaissance featuring shows such as Sailor Moon and Cardcaptor Sakura! When you open Domina Magica this book will guide you through the transformation from school girl to Magical Girl. Through this beautiful illustrated book you and your friends will play through a day in the life of a school girl turned Heroine. Domina Magica is designed to play in one session, with each game generating a different experience. One person will play as the Narrator who will help facilitate the game and control the various forces of evil. The other players will each form a team of magical girls who will discover their true identities and overcome both mystical and mundane challenges. This game has a custom made rules system, designed by Emily and Jim, that will encourage players to express their inner Magical Girls. If this Kickstarter successfully funds, the game book will be a Digest size, hardcover, embossed and foil stamped, premium addition to your game shelf. If we meet some of our stretch goals we will have the ability to improve the book with things like full color interior printing and additional art. With your help we would love to make this a true mythical tome to be passed down from one magical girl to the next. You might have seen these things spread all over social media, and if you have, great! That’s what we are going for! In an effort to raise awareness about this project, and women designers in general, we are giving every single backer a “Fight Like a Magical Girl” slap bracelet. Nothing says Magical Girl, or the 90’s, like a good slap bracelet. As part of this promotion we are going to be sending these out to backers RIGHT AWAY. Not during fulfillment, not once the kickstarter is over, but as soon as you back, you are getting a Fight Like a Magical Girl Slap Bracelet sent out to you. In return we are only asking one thing… you have to post a picture of yourself wearing it in your best Magical Girl Pose. We want to spread the word and the only way to do that is with your help. No Magical Girl can win the fight against evil without the other scouts!!! The realities of shipping, and the tight budgets of a kickstarter, means there are certain limitations that we unfortunately have to apply. All US backers at any level will get a slap bracelet sent to them right away as described above. For our international backers, it is just too cost prohibitive to send the slap bracelets as their own shipment. Instead, international backers who back at a physical reward level, will have the slap bracelet included with their book at fulfillment. We really wish we could send everyone the slap bracelets right away, but it just is not achievable. Our game has many unique aspects that you wont find in a typical RPG. The magical girl experience is not a typical play style for tabletop role-playing games and we wanted to make sure the game delivered on that approach. We have spent countless hours designing, play-testing and incorporating the feedback of these mechanics into this game. In Domina Magica your character sheet has 2 sides, one for your School Girl and one for the Magical Girl Persona. As you play the game, the actions and decisions you make as a School Girl (the first side) will directly affect your Magical Girl (the second side). Playing your school girl will actually build your Magical Girl! When it comes time for your special transformation you will physically flip the sheet from one side to the other and play with the character you have built. In the beginning of the game you and your friends will build a “cootie catcher” or “fortune teller,” that will help determine the events of the game as it progresses. At the start of the game players will work together to establish details about their unique episode. These aspects are used to fill in the cootie catcher’s various sections, and players will write in the theme, season, names, and more. Once the players have built the world their game will take place in, each player will add a secret trial on the hidden parts of the paper. At various points in the game, the cootie catcher will be triggered which will randomly activate one of the hidden trials the players created. Want to play a Magical Girl ala Sailor Moon or Cardcaptor Sakura? This game will take you there! It has the look, style, and feel of what you want in that genre. The creator has made the game with veteran players in mind, but set it up so new players with a love of Magical Girl animes will find it appealing! Need to know more? I interviewed Emily Reinhart of Third Act Publishing and the creator of Domina Magica over at the Open Gaming Network (here) about the game and she shares a lot of thoughts about why it’s a good one to own. Ends on Fri, September 7 2018 12:00 AM EDT. “Dive into a cyberpunk urban fantasy world filled with magic, espionage, hacking, and gunslinging action! Entromancy is a tabletop roleplaying game set in San Francisco in the late 21st century. In our world, a quarter of the earth’s power now runs on ceridium, a newly discovered element that has had the unintended consequence of spawning a new race of people, and several forms of magic that were once thought to have been forgotten. In Entromancy, you’ll take the role of a character in a futuristic, technology-driven, magic-rich world complete with espionage, spellcasting, hacking, and engaging action sequences. The core system of Entromancy is based on the world’s most popular roleplaying game, and will allow you to choose from five diverse races and five unique classes to create your character and begin your story. You’ll progress your character by taking on challenging missions and eventually embracing one of the game’s five brutally powerful destinies, which are like prestige classes. Want to stealth hack your way into enemy territory as a Vanguard, enhancing your faction standing with the underrace nation of Aurichome? You can do that. Interested in putting together a crew of NIGHT Agents to clean out San Francisco’s Presidio of zombie-like ragers? We’ve got you covered. Striving to climb the ranks of the Unaligned so that you can unlock the ferociously powerful, chaos-based magic of the Entromancer? No one’s stopping you…other than the other two power hungry factions standing in your way. Cyberpunk Fantasy Roleplaying. Enter a futuristic, magic-rich world where technology is ever-present and several forms of forgotten magics have resurfaced — for better and worse. Unique Characters. Choose from five diverse races and five unique classes — from the dual-pistol wielding Revolutionary to the magic-savvy Technomancer — to create your character and begin your story. Progress your character by taking on challenging missions and eventually embracing one of five brutally powerful destinies. d20 Mechanics. Experience a streamlined gameplay system based on the Fifth Edition of the world’s most popular roleplaying game, simultaneously allowing for exciting action and storytelling while providing for a great deal of depth. Action Gameplay. Get into the game quickly with easy onboarding for new players and engage in action-packed gameplay with spellcasting, hacking, cybernetics, and much more. Faction-Based Espionage. Increase your standing with Entromancy’s three competing factions of NIGHT, Aurichome, and the Unaligned, while attempting to make your mark on a world that has become fractured after years of population explosion, socio-economic tension, and magic-based warfare. NIGHT Agent. NIGHT Agents are special agents of the highest order, members of a paramilitary force that is called upon to enforce peace among aurics and humans — sometimes using extreme measures. As a Night Agent, you’re skilled in espionage and magical combat, and will have to decide between the paths of dark and light for your archetype. Revolutionary. Revolutionaries are allied to the underrace nation of Aurichome, sacrificing the comforts of the status quo for the promise of equality for all underraces. As a Revolutionary, you’re trained in all manner of ranged combat, and are unparalleled in your understanding of modern vehicles. Technomancer. Technomancers are gifted to the extreme in hacking, robotics, and manipulating any type of machinery. As a Technomancer, your training allows you to get closer to the metal with feats and spells than any other class. Terramancer. Terramancers have dedicated their lives towards communing with nature, drawing their inspiration from the flora and fauna around them. As a Terramancer, your proficiency with healing magic is unmatched, as is your ability to throw projectiles with deadly effect. Vanguard. Vanguards thrive in the shadows, specializing in the arts of stealth, assassination, and subterfuge. As a Vanguard, your skills in remaining unseen and getting the drop on your opponents is unparalleled. Aurikar Elite. Guns and spells have their places, but you prefer to get your hands dirty. You’ve mastered the art of hand-to-hand combat through training with King Thog’run’s special forces, and have sworn fealty to the crown as one of Aurichome’s elite defenders. Entromancer. You’ve spent time, energy, and no small amount of personal sacrifice chipping away at the mysteries of the universe. Ever so slowly, entropy begins to respond to your will. Infiltrator. When a job requires subtlety, they call for an assassin. When it requires a ghost, they call you. Inquisitor. You’ve entered the elite ranks of NIGHT leadership, empowered with some of the most devastating –- and manipulative — spells known to humankind. Weapon Master. Some heroes are born; others are forged through discipline and forbearance. You have become a master of arms, dedicating your life to the study of weaponry. This is bright, shiny cypherpunk! Set in San Francisco, you’re in a time of good power sources and magic, and yet, there are still bad folk aplenty to contend with. Also, it’s based around D&D 5e so the ruleset in a modification, not a brand-new design. If you want near-future, magic-meets-science yet the world did not fall to darkness using a system you know the root of, Entromancy has a place at the table for you. Add to that, Craig Campbell of Nerdburger Games acted as a mentor to the creator on this project and I think highly of Craig so it’s just extra winning. You can see examples of their work at DriveThruFiction here. Ends on Fri, September 14 2018 2:00 PM EDT. Disclaimer: I am a creator on this project. Looking for advice on how to create your tabletop RPG along with stock art to get you going? Learn from ” industry greats and legends James M. Ward, Lenard Lakofka, as well as exceptional talents such as Johnn Four, Rick Hershey, Lucus Palosaari, Kevin Watson, Bobby Nash and Egg Embry.” I’m excited to be a part of this project and offer my insights into the world of crowdfunding! Disclosures: This article contains affiliate links. Freelancer for EN World, Knights of the Dinner Table, Open Gaming Network, and the Tessera Guild. Want your RPG Kickstarter reviewed? Want to share news? Press releases? Rumors? Sneak peeks? Deals? Have some RPG wanna-lancer thoughts to share? Contact me here or on Facebook (Egg Embry) or on Google Plus (+Egg Embry).